The U.S. Coast Guard reported 4,158 accidents that involved 626 deaths, 2,613 injuries in 2016. If someone is injured in a boating accident, victims have the ability to sue the operator of the boat, the owner of the boat, the manufacturing company, the rental company, or other passengers who acted in a negligent or reckless manner during the incident. Check your local weather before departure. Some conditions to keep an eye out for include darkening clouds, changing winds, and sudden temperature drops. If any of these occur while you are on the water, get to shore as soon as possible to wait out the storm. One needs to ensure that they are driving at appropriate speeds for the area, as well as, continuously being aware of your surroundings. When possible, veer out of the way of larger vessels, and allow smaller vessels to safely pass by you. In case of emergency, there should always be more than one person in the vessel that knows how to operate the boat. If the primary driver became unavailable, the secondary driver would need to be prepared to operate the boat. They are called life jackets for a reason! The majority of drowning victims drowned because they were not wearing a life jacket. If you bundle up, you are lowering your risk of injury. Proper safe swimming habits are vital to a happy day out on the water. Check your local listings for classes through the American Red Cross. It is very important to be properly informed on how to operate the vessel. Check your state’s requirements regarding boater education. Before getting into your watercraft do a run through to make sure everything is working properly. Also the U.S. Coast Guard performs complimentary vessel checks to ensure boaters safety. 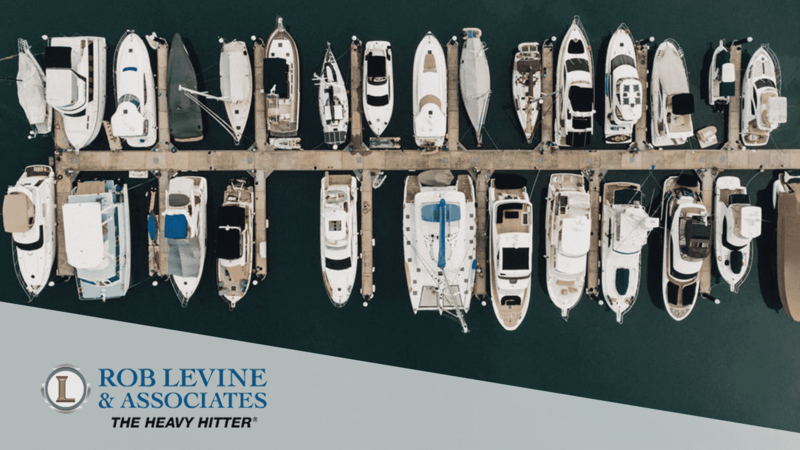 From pontoons to sailboats, if you or someone you care about has been injured or fallen victim of a recreational boating accident, it is important to know your legal rights and how to get compensation for your injuries. You should discuss your case with an experienced personal injury attorney. Getting legal help can put your mind at ease and let your focus on getting better. Rob Levine & Associates are experienced in personal injury cases in Rhode Island, Massachusetts, and Connecticut. If you or a loved one has been injured in a boating accident and need legal help, contact Rob Levine & Associates. Our experienced personal injury lawyers will review your case to help you understand what your next steps should be. Getting legal help can put your mind at ease and let you focus on getting better. At Rob Levine & Associates we are experienced in personal injury cases in Rhode Island, Massachusetts, and Connecticut. Our team is available 24/7 to help you. Contact us at 888.533.7507 or visit our website for more information.